The Airwrap promises to curl, wave, smooth and dry with no extreme hair-damaging heat. That's more promises than any man has ever made me so you can sign me right up. The hair is dried using jets of air and the Coanda Effect (#science), which is when a jet of air "attaches itself to a nearby surface and remains attached even when the surface curves away from the initial jet direction". Basically your hair will be whipped into shape thanks to the power pressure, air and Dyson alone. They've been working on perfecting the Airwrap for six years and have had hundreds of prototypes, so you'd better believe they've gotten it right. 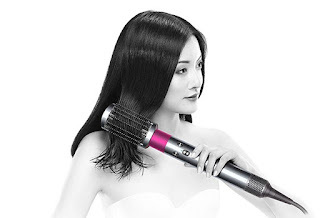 It comes with a whopping six attachments that curl your hair to different thicknesses (in both directions), create different blow-dry styles, and dry (yes, it's also a mini hairdryer on it's own). Perhaps the best news of all is that it's currently in stock in Australia! How much is the Dyson Airwrap you ask? It's retailing for $699 and it's likely to be a sound investment just like the original hairdryer (plus this one comes with a mini-dryer so double good investment!). Shop on the Dyson website here.